Advanced Virgo is the upgraded version of Virgo, that will start working at the end of 2016, entering the so-called era of second-generation gravitational interferometers. In the challenging run up to Advanced Virgo, the scientific collaboration of Virgo has also grown up, and now involves six European countries: France, Italy, the Netherlands, Poland, Spain and Hungary. In 2011, at the end of the first period of data taking, all the essential components of Virgo have been dismounted and are now being replaced by better ones of Advanced Virgo: this will lead to a boost in sensitivity of a factor of ten. The first version of Virgo, could detect gravitational wave signals from the coalescence of a binary neutron star up to a distance of 30 million light-years. If we consider the Galactic stellar population, this means that with initial Virgo the expected rate of detectable signals was only one every 20-50 years. This very low rate could explain why the previous generation of Virgo and LIGO detectors did not see any gravitational wave signal. However, the sensitivity of Advanced Virgo will allow us to observe gravitational wave sources ten times further away and explore a volume 1000 times larger than before. In such a large volume, the detection of a gravitational wave event will be way more probable. In fact, one could expect to detect at least one gravitational wave signal per month or even per week. 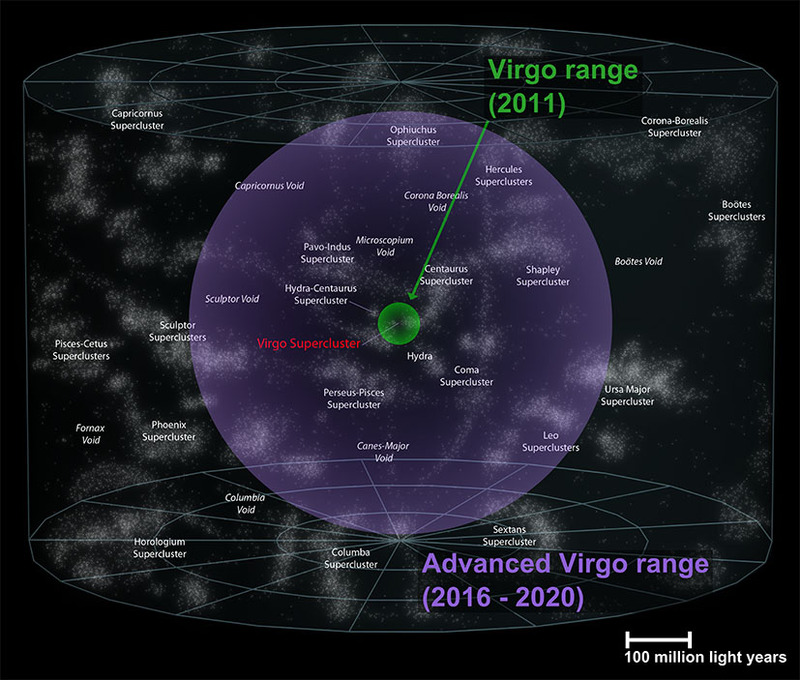 The volume of space accessible by the initial Virgo (green) and Advanced Virgo (purple) (Credits: The Virgo Collaboration)In order to achieve the jump in sensitivity of Advanced Virgo, the scientists of the Virgo collaboration have developed frontier technologies that will be crucial to reduce the spurious signals produced by various types of noises. The suspension system, which is fundamental to reduce seismic noise. In Advanced Virgo the mirrors at the end of the tubes will remain quiet even during a moderate earthquake! The new mirrors of Advanced Virgo have the best quality in the world. The defects on their surface are kept below one nanometer (a millionth of a millimeter). Also, they reflectivity is exactly as requested by the initial design. The mirrors at the end of the tubes have a reflectivity of 99.999%, and leak toward the external benches only 4 part per million of power, in order to control the interferometer performance. The input and recycling mirrors (LINK) have reflectivity much less than 100%, according to their function. Laser beam will propagate in an ultra-high-vacuum improved by a factor ten with respect to Virgo: the residual pressure in the tubes will be a millionth of a millionth of an atmosphere. The tubes of Advanced Virgo (7000 m3) will be the largest Ultra-High-Vacuum system in Europe and the third in the world, just after the two of LIGO. 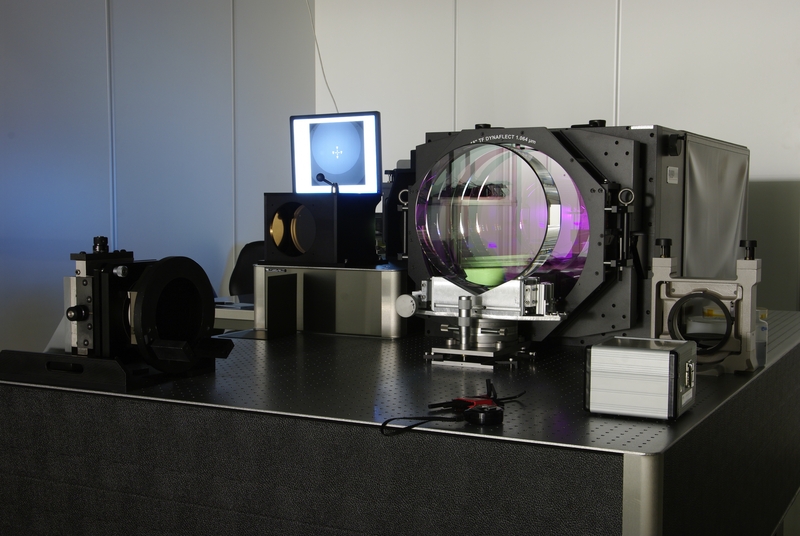 The electro-optical systems are much improved and make the high-power laser beams perfectly stable and controllable in wavelength, power, and shape of the beam. Even the infrastructures and buildings on the EGO main site have been upgraded to fulfill the requirements of Advanced Virgo.